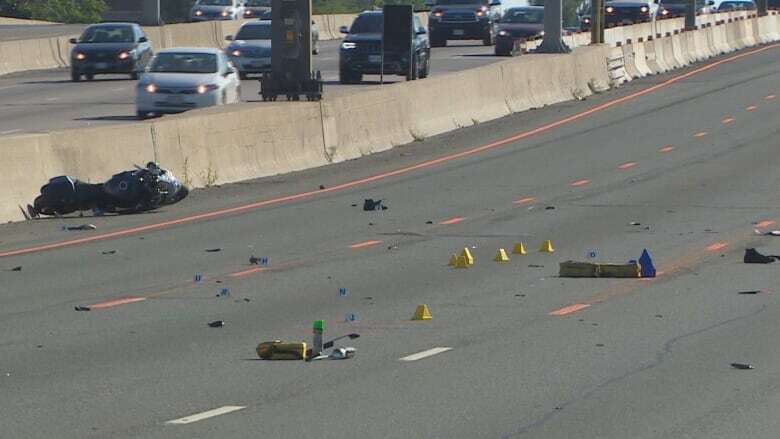 A male motorcyclist is dead and a female motorcyclist is dealing with injuries after a crash on Highway 401 early Saturday morning, provincial police say. Ontario Provincial Police (OPP) say the crash involved at least three motorcycles and a transport truck at around 3:30 a.m. on the eastbound express lanes of Highway 401 near Keele Street. Sgt. Colin Style of the OPP Highway Safety Division told CBC News that a group of motorcyclists was riding on Highway 401 when the collision with the truck occurred, adding police have not yet determined the sequence of events that led to the fatal crash and some motorcyclists have returned to the scene to give eyewitness accounts. "We are in the process of trying to determine what happened," he said. The name and age of the deceased male has not yet been released by authorities. 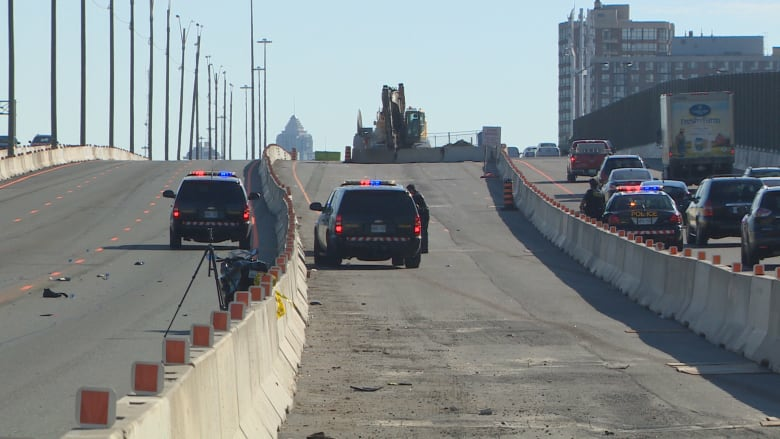 Police closed the eastbound express lanes of Highway 401 from east of Jane Street to east of Allen Road for much of Saturday while officers investigated at the scene. The OPP announced the lanes were reopened just before 5 p.m.
Sgt. Kerry Schmidt of the OPP said the investigation is still in its early stages. "We don't have a lot of details, but we are appealing for any witnesses that may have seen the motorcycles or the truck prior to the wreck at about 3:30 this morning," Schmidt said.